2017 was a difficult year and, for many reasons, I’m glad it’s over. But 2017 included some gifts and joys as well — especially the fact that THIS IS NOT A NORMAL ANIMAL BOOK brought laughter to some young readers! 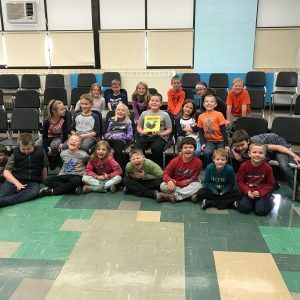 TJ Shay shared the book with his students and this photo after his students read the book now has a permanent place in my mind. I was also THRILLED when so many children’s book people I respect and admire enjoyed the book: the hilarious Betsy Bird included my wacky book in her Fuse 8 Production round up of the year’s funniest picture books; Minh Le dubbed it as one of the year’s most clever books in HuffPost; Michele Knott included it as one of her favorites of the year; and Margie Myers-Culver shared a review that made my heart explode with joy! I’m so grateful! Looking ahead to the first quarter of 2018 has me looking forward to more school visits, a novel writing class, a writing retreat with my Picture the Books debut author pals, and the Virginia Festival of the Book in Charlottesville in March. It’s shaping up to be a great year! Here’s to more laughter for us all. Happy New Year! I Live for School Visits!